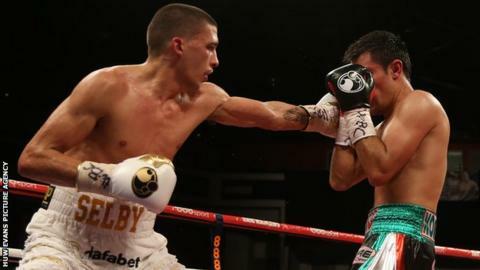 Welsh boxer Lee Selby is targeting a fight with Englishman Josh Warrington if he wins the IBF featherweight title. Selby faces Evgeny Gradovich for that belt at London's O2 Arena on 30 May. Leeds' Warrington said he wanted to fight Selby after winning the WBC featherweight title on Saturday, when the Welshman was ringside. "There were pints of beer thrown at me, so I would love to go up there and silence every one of those Leeds fans," Selby told BBC Radio Wales Sport. "The whole crowd booed me and called me all types of names I can't repeat." Warrington beat Dennis Tubieron to claim the WBC title, a belt Selby previously held. Before contemplating a bout against Warrington, Selby will face Russia's Gradovich for the IBF featherweight title. Barry's Selby, who has a 20-1 career record, stopped Joel Brunker in the ninth round when he last featured at the O2 Arena in October, 2014. The 28-year-old will take on an unbeaten Gradovich, who has won 19 out of 20 professional fights after his last contest ended in a draw. "My focus is on Evgeny Gradovich," said Selby. "I'm going to win this title then I'm going to come straight back to Cardiff and defend it. "I'll have another voluntary defence before the year is up, then I will probably have a mandatory challenger. "Then maybe a big fight in the Leeds stadium [Elland Road, against Warrington] in the summer , an outdoor arena with 40,000 [spectators]."